Immediately above, we proudly present the results of three years of effort on the PROJECT PASSION Delahaye recreation. 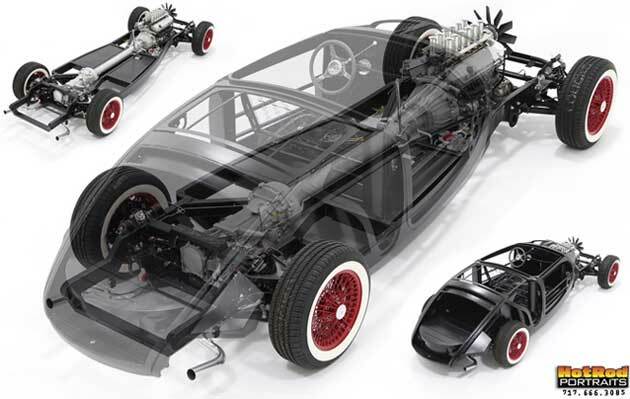 Metal shaper Joe Stafford of PANEL CRAFT, Bethlehem, NH fabricated the intricate lift-off body substructure that rests on a custom tailored rolling chassis by Steve Pierce of ONE OFF TECHNOLOGIES, Gilford, NH. All aluminum BMW V-12 block and cylinder heads connect to all aluminum C-5 Corvette rear-mounted transaxle and front suspension. Our Delahaye project expected completion date is early 2009. Special credit goes to the team of Steve Stoltzfus and Dan Gillespie of HOT ROD PORTRAITS, Lancaster, PA for their spectacular studio photography and see-through image. Since its inception circa 1994, DECO RIDES has created close to 100 Zephyrs, a handful of Boattail Speedsters plus a smattering of other, always different, smooth flowing, and often fun cars. If you look at our company logo, it represents what we feel to be the epitome of automobiles as art, two cars that have profoundly impacted our life. Since we could never afford to buy either of these cars valued in excess of 3 million dollars, and since they are probably not for sale even if we won the lottery, what follows is a report on our quest to build steel replicas of these two icons. Remember our motto, "Styling is Everything". 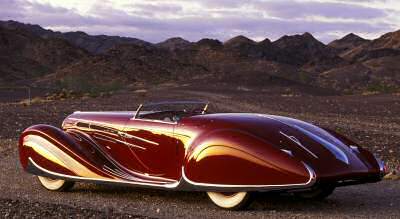 Among the world's greatest cars, two similar classic French streamliners are considered by connoisseurs to be rivals for the title "Most Beautiful Car In The World." They are the 1939 Figoni & Falaschi Delahaye Type 165 Cabriolet built by Figoni & Falaschi, and ther 1939 "Shah of Persia" Bugatti. 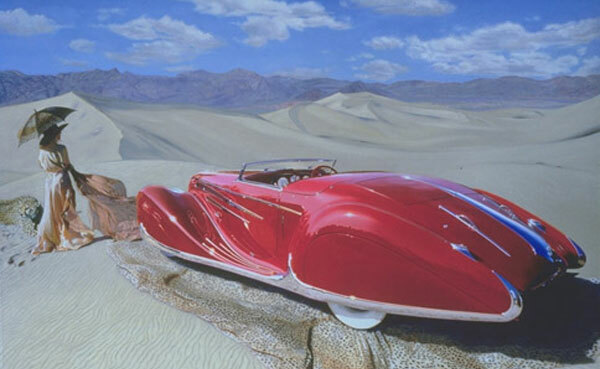 The Delahaye was designed by Guiseppi Figoni, contemporary and sometimes collaborator with famed French illustrator Geo Ham. For the history of this car, and the Shah car, click on DELAHAYE/BUGATTI HISTORY. The Van Vooren-bodied Shah of Persia Bugatti has remarkably similar styling to the Figoni Delahaye. One rumor is that the Bugatti is understood to have been secretly copied from the Delahaye "after hours" at the fall of 1938 Paris Auto Show. Ettore Bugatti was commission by the country of France to create a very special car which would be presented as a wedding gift from the country France to the Shah on the dawn of WWII. Totally smitten by these two pieces of rolling sculpture, for more than a decade Terry Cook has been obsessed with the challenge of replicating these amazing icons. This project is his passion. Now, collaborating with a crew of incredibly talented individuals, and graced with a customer who wants to see this car created, his fantasy is in the process of coming true. It combines the very latest computer car modeling and surfacing technology with mid-1930's metal shaping and forming. The result is going to be a very limited production number of hand built, extremely high quality cars that honor these two fabulous streamlined object d'art. They are a tribute to designers and coachbuilders Jean Bugatti, Figoni & Falaschi and Van Vooren. DISCLAIMER: It should be clearly understood that we are not so presumptuous as to be pretending to manufacture Bugattis or Delahayes. Both of these highly respected marques have a long heritage of being some of the world's finest automobiles crafted seven decades ago in France. The Bugatti name has been resurrected and we're thrilled to see that exciting new Bugattis are being manufactured again in Germany, now owned by Volkswagen. What we are doing is redesigning and scratch building all new cars that evoke and respectfully honor the styling of these two similar cars. The steel bodies of our new creations are built entirely by hand. The underpinnings utilize engine and running gear from modern American and European classics befitting the project. We're paying homage to these two fine automobiles. The autos we are building are not exact duplicates of either the Type 165 Figoni & Falaschi 1939 Delahaye Cabriolet or the 1939 Van Vooren Shah of Persia Bugatti. Rather, they are an amalgamation, borrowing from and combining the designs of both cars. We've subtly and respectfully redesigned both of our designs to incorporate some features not included in the originals. Currently there is no word we know that describes what we are undertaking. Because we are not duplicating the styling and engineering of these landmark cars, and because we are using modern running gear, we are not building a replica, pr se. Until we can find a proper term, for now we'll say we are building "Tribute" Cars. Previously we mentioned on this website that these cars might cost in the $200,000 range (composite body) or $275,000 (alloy body). After further investigation we've decided to only build the cars with metal bodies, and the price will be closer to $400,000 to $500,000+ per unit. The final price will be determined upon completion of the first vehicle. That cost will be about 10 to 15% of the estimated present value of the originals, but you will be able to drive them across country in comfort. Having obtained the financial backing of a customer who has the faith in Terry Cook to accomplish this gargantuan challenge, Terry has assembled a team of extremely talented specialists. Sean Halpin is the proprietor of Halpin Design, in Utica, MI. His computer design firm specializes in servicing the "big 3" auto manufacturers utilizing the very latest, state of the art software in automotive design. Sean earned his Associates Degree from Ferris State University in Automotive Design and Technical Illustration and his Masters Degree in Aerospace Manufacturing Engineering from UCLA. He has six years of Aerospace experience in the late 80's working on the B2 bomber, the F-20 fighter and the Atlas launch vehicle rocket program at Northrop, plus working on Rohr jet engine nacelles and General Dynamics space systems, and Saturn exterior panels. Automotively he has worked on projects including the Chrysler 1996 NS Minivan, Ram Truck and PT Cruiser interiors. Presently his firm is involved in a number of projects for the Big 3 that cannot be discussed because they are proprietary information. His expertise in class A surface development has been a critical element in the success of Project Passion. Effective March 2007, Joe Stafford of Panel Craft in Bethlehem, NH http://www.panel-craft.com/ will be building the alloy body for both the "Project Passion" Delahaye Tribute car as well as the "Shah of NJ" Bugatti. Joe Stafford has been a "panel beater", learning his craft and then repairing or creating alloy bodied automobiles for 29 years. While earning his apprenticeship in sheet metal fabrication at General Motors, he met a group of English panel beaters who offered him part-time employment working nights reproducing and reconstructing vintage historic race cars. After gaining five years of experience, he moved to MA where he worked for one of the world's most highly regarded classic car restoration shops. Paul Russel & Co. After 18 months he received encouragement from his clients to start his own business, New England Metal Crafters. Now known as Panel Craft LLC, since 1985 Joe's business now in Bethlehem, NH has probably created 100 alloy car bodies. We selected him to work on Project Passion because of his high quality workmanship and close proximity to Steve Pierce's ONE OFF TECHNOLOGIES in Guilford, NH. Stephen Pierce is the Founder/President/Owner of One-Off Technologies Inc. in Gilford, NH. For over 30 years his firm has been building Hot Rods, Customs and Promotional Vehicles as well as other numerous projects to include large format billboard art. Although recognized as one of the leading interior trimmers in the country, Steve also taught himself nearly every phase of the coach building craft. His ground up projects have been featured in many national publications and have been featured in many of the premier auto shows throughout the US. Stephen has now joined the Project Passion Team to help build the chassis on the first Delahaye and Bugatti prototype replicas. Brett Anderson is the proprietor of KOALA MOTORSPORT LLC in Novelty, OH. For fifteen years he has been rebuilding and restoring BMW's for racing and street use. The engines selected for this project are 1988-'94 M70 5 litre V-12's, and they are being totally rebuilt by Brett. This engine was selected because we felt the project merited something with a minimum of a dozen cylinders. The engine produces an adequate amount of power, has a fabulous physical appearance, but is not hampered by the complexities of a brain box and computer similar to those incorporated in 21st century BMW's. For more information, go to DELAHAYE/BUGATTI CONSTRUCTION and DELAHAYE/BUGATTI HISTORY. We offer a seven minute DVD on DECO RIDES products in general, not focusing specifically on the delivery, plus an additional seven minutes focusing on the PROJECT PASSION Delahaye and Bugatti. $10 in the USA, and $15 foreign. Make checks payable to Appleton Productions Inc., and send it to DECO RIDES, PO Box G, Long Valley, NJ 07853. We take credit card orders by phone, (908) 876-9727 Mon.-Fri. 10 AM to 3 PM EST.